The Sheriff's Department is a diverse organization of hardworking and dedicated professionals who are involved with many facets of our community life. 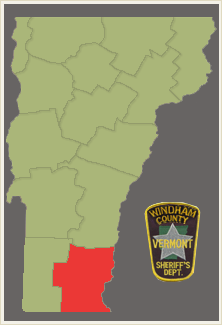 The Windham County Sheriff's Department's mission is to provide high quality court support services and effective, responsive, ethical and affordable policing. The Windham County Sheriff's Department will be recognized as the county's premier law enforcement agency providing innovative programs, cutting edge technologies, and high quality services throughout all of Windham County while retaining the Department's reputation for being respectful, compassionate, fair and ethical. This listing below is not yet complete. We will update the list when the research has been finished.